At 10 years old, Wanny arrived to the US not knowing a word of English. He was thrown into the second grade only knowing the ABCs and 1-2-3s. He became a master at the phrase, “I don’t know,” using it often as he was learning the English language. After graduating from high school, he went on to college to pursue a dream his parents had set for him. Two years into college he realized becoming a doctor and working in the office was not what he wanted to spend the rest of his life doing. During his college years Wanny attended motivational seminars. Through those seminars he found his true calling. Inspired and moved by a speaker he had just seen, it was at that moment when he knew that this was what he should be doing. Wanny wanted to move and inspire others the way this speaker did for him. After two years of college Wanny dropped out and began taking on odd jobs. One of his jobs included working part time at UPS loading and unloading packages. During his time at UPS, Wanny discovered one of his co-workers worked a part-time job for the airlines. She explained to him all the great benefits in working there. The one perk that captured Wanny was the chance to fly anywhere in the world for free. Wanny was sold. He jumped on board and for the next nine years he traveled and saw many parts of the world, some of them the most exotic places where one can only dream about. His flights were first class sitting alongside of CEO’s of Fortune 500 companies surrounded by successful individuals in their respective fields. He modeled after the ones he admired and looked up to them by reading what they read, and dressed how they dressed. During one of his international flights, Wanny came across a seatmate who recommends him the book “Rich dad poor dad” by Robert Kiyosaki. This book inspired Wanny to start a career in real estate. Wanny invested his finances from his newly found career to buy rental properties. Little did he know he had come at a time when the real estate market was hitting a downfall. In a few short years Wanny lost everything. Down to his last dollar, Wanny Huynh knew he had to make a decision that would turn his life around. A notebook and pen would transform him and teach him a path forward to overcome any obstacle. In HOPE: Finding the Path toward Happiness, Opportunity, Prosperity, and Enjoyment, Huynh reflects on escaping a life of poverty and slavery in Vietnam and using tough memories as a reminder that there’s no obstacle too great to prevent anyone from achieving their dreams. With this book, Huynh will show you how to address the underlying problems in your own life and create a new, better you. Despite great intentions to get things done, do your goals sit in a large dusty pile, neglected? The remnants of dreams you thought would come true? It’s not too late to brush them off and breathe new life into them. Wanny Huynh, distinguished motivational speaker and author of The Five Laws to Wealth, Success, and Happiness, has written a new book which tackles one of success’ greatest adversaries: procrastination. In his bestselling Five Laws, Huynh delved into failure and its uncanny way of tricking people into believing they couldn’t overcome obstacles. In the follow-up How to Overcome Anything, the author chronicled his personal hardships and provided the ten-step program he used to claw his way up from the pits of despair. Building on his inspirational self-help opus, Procrastinator to Finisher—7 Secrets that Transform even the Laziest People into Productivity Machines, reveals an infallible plan that simply works. Are you a master at stalling? Do you postpone almost everything? Has putting things off cost you money or relationships? Your answers determine what you'll be able to achieve in life if you continue on this path. You may have great intentions and you may tell yourself before you go to sleep that tomorrow will be different, but every morning you find yourself stuck in the same pattern and it just seems easier to stick with what you know. In Procrastinator to Finisher, Huynh candidly shares his hard-fought battle with procrastination and how it almost beat him. He explains the seven secrets that worked for him and which will help you finish any job you start, reach any goal you set and achieve any dream you have. Just as you don’t ascend a flight of stairs in a single bound, your goals are the same. But once you read the simple technique within this book, reaching the top becomes second nature and you, too, will become a finisher. Would you like to read a book about success that is unlike the others in its category? How about a fresh reference without the same old prose and promises? If your answer is yes, then The Five Laws to Wealth, Success, and Happiness is what you’re looking for. 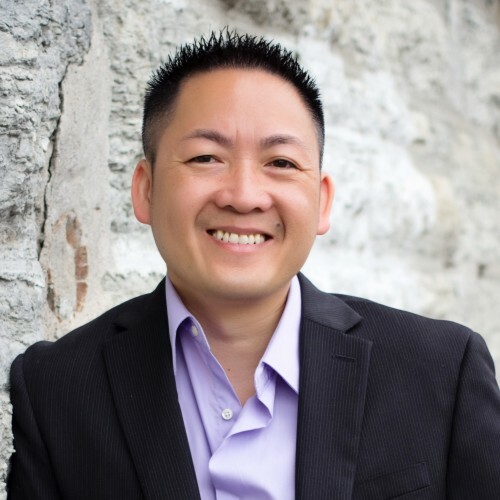 Learn how a ten year old boy from Vietnam arrived in the U.S.A. and went from knowing only his ABCs and 123s, to becoming a prosperous speaker, entrepreneur, and coach. His victory wasn’t achieved by following his parents’ wishes that he attend medical school and become a doctor. It was by hitting rock bottom and then digging even deeper to uncover an alternate way to the top. Author Wanny Huynh breathes new life into the self-help genre with his inspirational mix of part autobiography and part handbook of proven techniques. He overcame adversity by following the outlined steps. They will work for you, too, if you learn to identify and use: The Law of Least Resistance The Law of Visualization The Law of Adaptation The Law of the Subconscious Mind The Law of Action Would you like to finally face the obstacles in your life without fear and without turning back? The Five Laws to Wealth, Success, and Happiness takes a candid look at failure and provides a step-by-step guide to finding your way through it and emerging triumphant. Goals! Goals! Goals! You are told to set goals because they’ll help you achieve great things. But no one tells you exactly how you are supposed to get from Point A to Point B successfully. Well, that’s about to change. Wanny Huynh, popular motivational speaker and author of The Five Laws to Wealth, Success, and Happiness is back again, this time tackling life’s adversities with How to Overcome Anything: Go from Rock Bottom Straight to the Top in 10 Steps. Wanny’s story is one of inspiration. He shares incredible hardships his family endured and subsequent struggles he faced in life in order to demonstrate no obstacle is ever too big to overcome. No roadblock is without a detour and he is here to show you the way. The author explains each of the ten steps between Point A and Point B and gives you two simple action items needed to accomplish that leg of your journey. No more writing down destinations and taking off blindly. Consider this book a Goal GPS that can be turned on no matter where in life you want to go. Get ready to develop skills that turn your dream–big or small–into an achievable event. It isn’t an overnight process, as some may lead you to believe. It takes effort, but you are the pilot and will be the one who determines how fast and how high you climb. Squash your critics with one simple word. Watch your fears disappear one by one. Find out how serving your community is serving yourself. Discover how your passion can be turned into abundance. Are you prepared to think and act like a champion? Get SMART, take action, and triumph when you learn How to Overcome Anything: Go from Rock Bottom Straight to the Top in 10 Steps. Find out more about Wanny Huynh at http://www.wannyhuynh.com.